Apple hides certain files and folders on your Mac to prevent you from accidentally changing or deleting important data your Mac needs. When you need to modify one of those hidden files, you must reveal it in the Open or Save dialog boxes by pressing the Command+Shift+. combo. A display bug with showing and hiding files in an Open or Save dialog box means that the keyboard shortcut won't work in the Finder's Column view mode in OS X Mavericks or OS X Yosemite. The remaining Finder views (icon, list, cover flow) work fine for displaying hidden files. 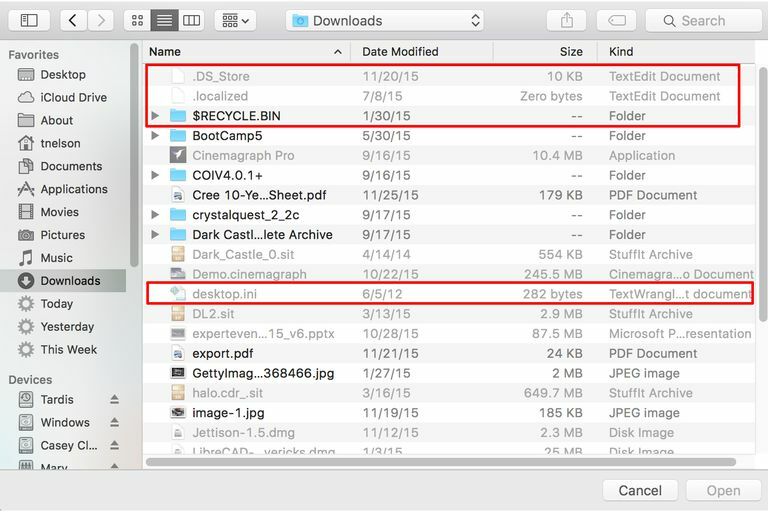 The keyboard shortcut for showing hidden files in Open and Save dialog boxes works just fine in El Capitan as well as macOS Sierra—however, there's one additional detail. Some Open and Save dialog boxes in El Capitan and later don't display all of the icons for the Finder views in the dialog box toolbar. If you need to change to a different Finder view, try clicking the Sidebar icon (first one on the left) in the toolbar. This toggle should cause all of the Finder view icons to become available. Using the Open or Save dialog box to view hidden files does not change the files' invisible attribute. You can't use this keyboard shortcut to save a visible file as an invisible one, nor can you open an invisible file and then save it as a visible one. Whatever the files' visibility attribute was set to when you started working with the file, that is how the file will remain.